Stupid Government Tricks, Let’s Tax the Millionaires, Where Will the Jobs Come From? With seven kids, jobs have been on my mind of late. It has not been easy for some of them. It helps me to remember what it was like to be in my 20s in the '70s and to really struggle to pay the rent and put food on the table for a family. Savings? Hah! And while I have been able to help the kids here and there, back then there was no one to help me. More than a few nights, I woke up with a knot in my stomach, wondering whether to pay rent or make payroll. College did not prepare me for the "joys" of being an entrepreneur. Interest rates were 18% if you could even find a bank in Texas to lend on hard receivables. Unemployment was north of 8% and sometimes 10%. The Japanese were beating our brains out. It was the Carter malaise years. All my friends were struggling as well, so it seemed normal. Kind of like now. And I know I have written this before, but it bears repeating. The correct answer then, as it is today, to the question, "Where will the jobs come from?" was "I don't know, but they will." That is what free markets and entrepreneurs do: they create jobs where none existed, given the chance. And that's how it looks today. 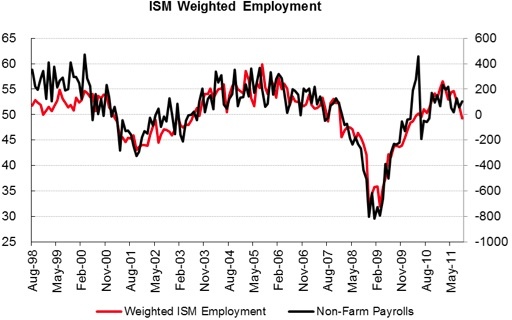 This week's ISM and jobs reports augur poorly for employment in the coming months. "Economists miss the start of recessions for two reasons: 1) they focus on coincident to lagging data, and 2) they use data series that are heavily revised, rendering them useless in real time. "For example, most mainstream economists did not recognize the beginning of the last recession that began in December 2007 until mid-2008. Leading indicators had plunged, yet coincident and lagging data continued to be positive. However, once the data for non-farm payrolls and GDP were revised, the loss of employment and the loss of economic output were much greater than had originally been estimated. In all likelihood, we are seeing a similar dynamic play out today. "All of our leading indicators have been pointing down since early spring. Now many unrevised short leading indicators are pointing towards weakness in employment, output and asset prices. The GDP weighted employment reading for ISM services and manufacturing is now clearly below 50. The last times this happened was before the 2001 recession and before the 2008 recession." You can't read any serious economic analysis of late that does not talk about jobs, whether in Europe or the US or Asia. And not a lot of it is pretty. Politicians offer "plans" for jobs, most of which go to great lengths to illustrate the sympathy they have for people out of work, but without offering any real ideas on how to create meaningful, lasting jobs. Some are actually destructive of jobs, far from creating any (these are of the "I'm from the government and I'm here to help" variety). The book will be US-centric in its focus, but the policies we will be talking about can be adapted to almost any country. And as long-time readers know, when I start on a book project, some of it tends to leak into the weekly letter; so in between writing about the crisis du jour in Europe, I will give you a small preview of where we are going. I should note that Dunk and I will be getting a little help from our friends, and we want your help in some very specific ways. First, I know my readers are among the smartest on the net. If you have an idea about how to increase employment, send it to us. Put "jobs" in the subject line. Also, most of America is familiar with David Letterman's occasional skit called "Stupid Animal Tricks." We want to do a section on government policies that hurt job creation. At all levels, from local to national. Send us your anecdotes and notes on odd rules and laws that destroy jobs and opportunity, rather than create them. Almost everyone has a story about how government is hurting their business. Tell us yours. In that regard, I call your attention to a column in Thursday's Wall Street Journal by Daniel Henninger about whether Texas Governor Rick Perry (now candidate for president) can take credit for the jobs creation that has been happening in Texas. And the writer's point, and I concur, is that he can only in the sense that he didn't get in the way and did help pass a few bills to make it easier. And you do have to give him credit for being aggressive about luring businesses. But that has been the case as long as I can remember. Democrat or Republican, Texas governors and politicians in general recognize that businesses drive employment, which drives the economy. In that regard, Perry does "get" what helps create a favorable business climate (not that that would be the reason to elect him). The columnist interviewed a lot of businesses that had come to Texas. It was not just lower taxes that brought them; it was an overall favorable business climate and an able workforce that made the difference. "In 1990, one of the world's biggest companies, Exxon Mobil, left New York City for Dallas. Exxon's former CEO, Lee Raymond, says the move in part was indeed about costs and New York State's notoriously overbearing tax authority. But it was also about working amid a culture of competence. ‘It's just the attitude in Texas of getting things done and doing them well,' he says. "Mr. Raymond remarks that the economic policies that in time trapped the Northeast and Rust Belt in spirals of decline never touched Texas. But this is about something beyond low taxes and no unions: ‘In Texas the people tend to be farmers or individual businessmen, and they have this attitude: We have to make do with what we have and work together to get things done and survive. It's can-do. That attitude permeates everything there.'" And while the part of me that is deep-roots Texan likes to believe that somehow we are special, the part of me that has been to 49 states and 60 countries smiles a little at my pride. I find that same attitude in Maine, where I go fishing in the summer. And in Atlanta, where I will be next week. And in New York City, and Colorado. Everywhere I go I find people wanting and willing to work hard. It is not just the US, either. As I noted a few weeks ago, the Irish may be at each other's throats with their politics, but they are united in their desire to "sell" Ireland as a center for business (and the jobs businesses bring). And while the Dutch work many fewer hours than we do in the US, their productivity is manifest and their export power per person is amazing. South Africa? Thailand? Japan? China? I could go on and on. Everywhere I go I see the drive to excel and get things done. Yes, with different local emphases, but with that same basic human drive. "When word of the 2006 move got out, ‘California made no attempt to keep us.' In Texas, ‘things started to happen quickly, without us initiating them.' The Irving Chamber of Commerce did orientation sessions for employees and spouses, even helping with new-house searches. Or ‘little things': Irving on its own renamed a street Fluor Drive, which in California or the Northeast would be laughable. Those Texas rubes!" But the workers of California are no slouches. Witness Silicon Valley. And the amazing biotech companies of Southern California. And California farm productivity is legendary. "Look, we are in a remarkable moment and I'm not sure we're noticing it in the day-to-day of politics and media. Last week I wrote of the new patriotism that I see taking hold of the American establishment, if that's the right word—business leaders, doctors, scientists, entrepreneurs, journalists and lawyers who find themselves feeling a great, deep yearning to help save their country. That public-spiritedness is waiting to be harnessed and led by good men and women who, in words I'll explain in a moment, have passion not for themselves but for America. "What's behind it is fear. The economy is tanking and can take a whole world with it. But what's interesting—and new—is that the fear is not finding its expression (again, among those loosely described as the establishment) in rage, or in deeper partisan antagonism. Democrats could be feeling bitter and snarky: President Obama didn't work, and they're not in love with him anyway, so why not bash Republicans just for fun? Republicans could be feeling mindlessly triumphant: We're on the verge of a major victory, make way for your new rulers. But that's not what I'm seeing. What I'm seeing is a new convergence of thought among Democrats and Republicans who are not in Washington and not part of the political matrix. They are in new agreement about our essential problems and priorities: that the economy comes first, all other crises (in foreign affairs, in our culture) come second, because they cannot be helped without an economy that is healthy and growing. They all agree—no one really argues about this anymore—the government is going bankrupt. They all agree the entitlement system has to be reformed. Heck, they all respect Paul Ryan, for his seriousness. They all want grown-ups to come forward with ideas that maybe each party wouldn't love but that might do the country some good. "That is what I see in every business and professional meeting, in conversations with Democrats and Republicans: a new convergence of thought among the thoughtful." What do you want from leaders. From Iowa: ‘Someone who isn't hollow.' "
"They all said they care about 2012. They all said they'd vote. "We are in a remarkable moment. Everyone understands the stakes. Everyone wants action. From comfortable professionals to people barely scraping by, everyone wants both parties to work together, to think of our country and not themselves. "And of course everyone really gets this except Washington, which says it gets it and doesn't. But those who think 2012 is just a clash of big parties had better wake up. They think they're pulling and pushing in a tug of war, but they are dancing on the precipice." Precipice indeed. It is the Endgame. We are watching it play out in Europe, but we all know it will come to our own shores all too soon if we do not act. I hear this everywhere I go. The meeting I had with those ten Senators a month ago resonated with readers. I get asked over and over, "Do you think they understand? Will they do something?" Most of the times their voices are tinged with hope. Sometimes, though, it's resignation, and the follow-up questions are in the "How do I protect my family and survive this?" vein. "The hard truth is that things are pretty lousy for most Americans right now. And while students, seniors and workers didn't cause our economic collapse, we're the ones paying the price. It's been three years since Wall Street CEOs crashed our economy. When Wall Street was on its knees, the American taxpayers came to their rescue with trillions of dollars in bailouts and promise from the big banks that they'd invest in our recovery. "Instead, the banks used our hard-earned tax dollars to enrich themselves. They robbed millions of Americans of their jobs and their livelihoods. They refuse to invest in the small businesses that drive America's job creation and growth. And they continue to kick us while we're down by foreclosing on millions of families. "…We can't begin to fix what is wrong with our economy without creating good jobs. We have work that needs doing in this country and millions of Americans looking for full-time work. It's time to put the two together to make America a stronger nation. And it's time to use the money being made on Wall Street and in corporate boardrooms across the country to put Americans back to work. "Congress can begin by passing the American Jobs Act and immediately put Americans to work rebuilding our outdated and dangerous roads and bridges and ensuring our kids have first-class schools. We can invest in our communities to keep teachers in our classrooms, police on the beat, health-care workers at our hospitals and clinics, and ensure that we have enough firefighters to protect our communities." The disconnect between the two columns simply leaped at me. Both note the angst that is palpable in the country (and around the world in developed countries). But one called for adults coming together and the other struck a severely partisan note, which I guess you might expect from the head of a government workers' union. Which brings us to the question, "What is the role of government in creating jobs?" To answer that, let's look at the data that shows us where jobs come from. And we find (I go in-depth on this in previous columns and in Endgame) that net new jobs for the last 15 years came from new business start-ups. Big business is a net drag on job creation, and small businesses are a wash. Governments have seen job growth, but where does the money come to pay government employees? Net new jobs come from new businesses (defined as those started within the last ten years). Yes, some of those businesses become Google and others are the local dry cleaner or donut shop. But those start-ups (if they survive) are the source of new jobs. Ms. Henry wants to tax the millionaires, as if they are somehow sucking the system dry and should "pay their fair share." Her answer is to tax them and hire more government workers. But that simply transfers income from one party to another and does nothing to create real wealth. And this has been brought home to me recently in a very personal way. My youngest son, Trey, has been spending a lot of time with a new friend, and I decided I needed to meet his father. I went to their home to check them out. The father, Larry, was from South Africa and had just moved to my neighborhood from Utah. He said he was in software design. We became friends, and one day I probed a little deeper into what he did. It turns out that he had designed a system (and patented it) that automatically triggers a "911" call (the US emergency number) if you are in an auto accident, as long as your (smart) cell phone is on. Yes, the phone can recognize when you are in a vehicle and there is an impact, and that is different from dropping the phone or even throwing it into a wall. It can notify family members (or friends) if there is an accident and tell them where you are. It will work in almost any country. If a button is hit, it can silently call emergency services. It can also track your kids or employees and let you know all sorts of things you ask it, but that's another story. But he was in the middle of a funding crisis. I watched for several months as he struggled for money to finish his project. It was 98% of the way there, with thousands of paying users in "beta." It was cheap. It worked. There was demand. But he was losing his funding. Why? His original source had been a wealthy entrepreneur who had a "liquidity event," selling his business for a large sum. As part of his reinvestment, he funded, with a small part of his money, a venture capital firm that had the goal of investing in 40 start-ups, mostly in high tech, which was where he had made his original money. I talked with the manager of the fund. The story was typical of others I have heard. In just a few years, 10 of the original 40 had already been shut down or sold off. But the manager was not discouraged. Their plan was in the end to get ten businesses that survived and were successful. Think about that for a minute. A lousy 25% success rate?!? Would you start a business if you thought there was a 75% chance of failure? Really? Would you fire a manager who had 75% of his projects fail? Understand, they had looked at multiple hundreds of business ideas to get to that 40. Those were the best ideas they saw. They initially thought every single one had a chance of success or they would not have funded them. Do you think that because you like to make pies and are good at it you can open a pie shop? (his illustration). You'll soon find out you are not just in the pie-making business. You have inventory, employees, payroll, marketing, budgeting, customers, taxes, government forms, regulations, etc. They take your time away from doing what you thought you were good at. I grew up in a print shop. And when I was in my 20s I found out I could sell. And because I knew printing and could sell, I opened a print shop. Several times. You would think I would have learned. Starting a business is more than just having technical knowledge or skills. It is a host of things, and it is very hard to make one work. But the good news is that optimism triumphs over reality, and as a society we all benefit from those who take the risks and figure it out. And jobs get created. The rich entrepreneur who funded Larry's start-up? His basic business and investments hit a bump in the recession. He had to reduce his funding commitments, and one of those casualties was Larry, who went into scramble mode when his next source also went upside down. The point? The entrepreneur with his venture capital firm is one of those millionaires that some want to raise taxes on. If you take another 5% from him, that is 5% less that he can invest. I am somewhat like him, on a much, much smaller scale. I am a serial entrepreneur. I can't help myself. (Is there a 12-step program?) I won't pretend that if my taxes go up 5% from where they are today, I won't start or invest in a business if the right opportunity comes along. But that is 5% less that I have to use for risk capital. At some point along the tax curve the risk is not worth it. And that 5% may actually represent 30-50% of the annual growth in my risk capital, as venture capital is the very last part of my residual capital and income that gets allocated. Multiply that by one million potential entrepreneurs, just in the US. There is a certain portion of the human breed that is by nature and instinct entrepreneurial. They see opportunity and look for ways and means to make it happen. Family, friends, and so-called "angel" investors fund these start-ups. More and more we see quasiformal networks of angel investors forming. They often go in together and mentor and help start-up companies and businesspeople. These are the millionaires who are somehow not paying their fair share. Yes, there are Wall Street bankers and some professionals that make large salaries, but most of the high-income earners in the US are owners/founders/investors in small business, or got that way as a result of a small business that became larger and successful. Some become Bill Gates or Steve Jobs – the billionaires. But those successes are rare, very rare. Without growth in private GDP, or the portion of GDP that is not government-related, there will be no job growth for the rest of this decade. 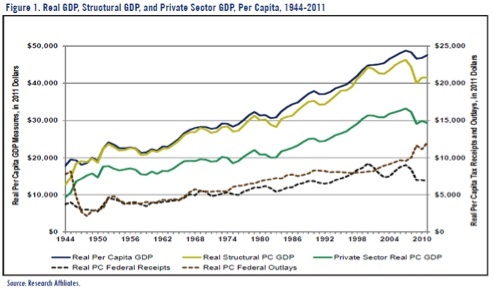 Private GDP has been flat for 15 years (in real terms). The chart below shows how important government spending has been to official GDP figures. The "growth" of the economy has been in government spending and debt. But that source of growth is going away as governments are increasingly constrained by revenue losses and debt. We can talk all we want about how we need to make a commitment to government jobs, but the reality is that we are at the Endgame of government spending, both in the US and in Europe. How do we grow our way out of the current crisis? We have to have more private-sector jobs. Period. End of story. And that means we have to figure out how to make it easier for entrepreneurs to find and access capital. Taking capital away from investors who fund these start-ups will not do the trick. Let me hasten to say I am not against government spending or taxes. A certain level of government spending is necessary. And as I outlined at length in Endgame, I am all for increasing energy taxes (slowly over time), to be used 100% to rebuild our crumbling infrastructure (funding goes directly to local and state governments), which, yes, produces government-financed jobs. But we simply do not have the funds to take national taxes to fund local needs, no matter how worthy. If something is needed on a local or state level, that must become a local funding issue. If California wants to pay its prison guards $100,000 a year, that is their choice. Or pick a state, any state – they all have needs. We have plenty in Texas that needs funding, for sure. It is time to hit the send button, so let me close by saying that we really do want your input on this new jobs book. Dunk and I and the other writers want to contribute to the national conversation that we must have next year. It is a very timely and worthy topic, and there is much more to say. It is not simply "support your new small businesses." It is far more complex and will take a book to go into the detail that is needed. We want your input and ideas. Put "jobs" in the subject line. Let's start an adult conversation by exploring the nuances of how jobs are created and how we can help the process. As noted at the top, I am in Kilkenny, Ireland. I got off the plane, drove to Kilkenny, and saw posters with quotes from me on the walls around town. That was different. I was almost immediately grabbed by host and event organizer David McWilliams, for what I was told was the #1 radio talk show in the country. Very thoughtful host and large, sold-out crowd for the show. The first panel session was tonight. I found myself in an unusual role. Normally I am the radical in the group. Here it was a very mixed crowd, liberals and conservatives and everyone ready to mix it up, along with some very funny stand-up comedians! And tomorrow I am on three panels or speaking events. Lots of readers were in the audience, and it is all quite fun; although, when I talk about reducing deficits I am not used to getting boos and cheers at the same time. Like I said, interesting and fun. I then go the following week to Washington, where I will be at the National UBS conference for a few days; and then I am home until mid-January, or at least I don't have to get on a plane unless I want to. As much as I enjoy meeting people and seeing new places, I am looking forward to being home for an extended time. Tomorrow I will wander around Kilkenny and visit the local castle and learn some of the history. This was the first capital of Ireland, and there are some VERY old buildings here (as in 900 years plus). And walking back tonight I got the sense of a very lovely place. I will probably want to come back. Have a great week. And go out and tell an entrepreneur thanks. Where did all the jobs come from 40 or 50 years ago, when the rich were being taxed at a much higher rate? Where did all the jobs go in the last 20 or 25 years when the rich were being taxed at a lower rate? History refutes your argument. The conditions have changed. Before 1980s US was much more competitive compared to other nations. Many American products were unique in the global market. Today only US made weapons are unique in quality (if we don't count dollars manufactured by FED to buy oil), thus America does not have superiority over many products and services. China or other export-oriented countries can duplicate anything. So America has to compete. It needs lower taxes, less regulation, less government spending (except infrastructure), improved education, more efficient labor market, and a financial system which encourages saving. But before all these happen, US will surely experience bad debt/credit liquidation through inflation and eventually get rid of banksters. It does not differ whether federal government can reduce deficit by a couple of hundred billion dollars. Being a Turkish citizen who has lots of friends from America, I can see this as an outsider. The last thing US do should be increasing taxes because American people are already being taxed and will be taxed at least for the next 6-7 years via INFLATION. US cannot pay all that debt without covert default (monetary inflation is inevitable). Avoid and stop any extra taxes, especially VAT. 07 Nov 11, 17:43 "this time is different"
Ah, yes, the "level playing field" of globalization. Where desperate workers compete for lower wages and benefits, poor working conditions and more destruction of their environment, as corporations and the rich rake in more profits and pay even less taxes. There never seems to be a distinction between the taxes working people pay (including inflation) and what the rich pay.